What appears to be a problem is actually part of your answered prayer. You’ll understand the reason behind your present situation as everything resolves. Trust in Heaven’s protection and infinite wisdom to answer your prayer in the best way. Leaning forward, through pursed lips, our angel sighs the answer to a desperate prayer. Behind her, the answer is formed. The winds of love and compassion and truth blow through her to you. This image explains that she is not merely a vehicle to transfer the message, she becomes the message. Her wings and dress absorb the colors behind her. The image of the mixed-colored clouds gives us a hint that our answer isn’t going to be a quick one. Every shade and nuance of blues and grays and oranges foretell a journey filled with shifting patterns and unexpected swells. These swirling colors help us to understand that, while in the end the answer may be just what we had hoped for, the journey itself may not be what we expected. Still, this exact patchwork is necessary to create the pattern that is our ultimate answer. Our blessing. Even I it’s often times disguised. Have you ever turned the corner and wondered why you did? You haven’t been that way since you were just kid. You wonder what would happen had you gone the other way. Oh, there are strange rivers, rivers that we cannot see. 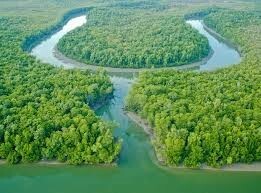 There are strange rivers who know our destiny. There are strange rivers who brought your love to me. When we consider the message of Blessing in Disguise and read the words of John Stewart’s Strange Rivers, no doubt an event comes to mind. What would have happened had you gone the other way? It may be something super simple. It may be forgetting to buy the ketchup and having to return to the market only to run into a long-lost friend. It may be that the ridiculous 20-minute search for your car keys prevented your taking part in the accident you later pass on the side of the road. It may be something much more complex. It may be the loss of a job that pushes you into a position at another company where you find your wings and soar. The car that won’t start in the parking garage that leads you to the bus stop where you meet your future life partner. We all have them. The tricky part is recognizing them. But how do you do that? Nearly impossible without understanding – and adopting – a few Truths about answers and how they present themselves. The starting point is gratitude. I know: The G-word, again. In the throws of upset and turmoil, how can you hope to cheer, “Oh, great! I was so hoping that I would need a new hot water heater that I can’t afford! I’m lovin’ this journey!” You probably can’t. Still, it’s in those exact moments that you not only should, but must, take that proverbial deep breath (and crying is also permitted) and then come to the understanding that there’s a purpose. And that purpose, by the way, may well be to teach you a life lesson, but it’s never to harm you or break you. In the times when it’s most difficult to understand what in the heck is happening, allowing your mind to wander (don’t hesitate to be creative!) 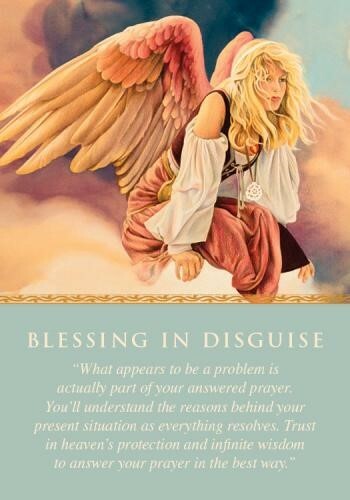 and asking for angelic intervention you may be able to see the many parts of the bigger picture that is unfolding in front of you. When you are feeling as though your prayers aren’t being answered; that help is not on the way; that you have been somehow forgotten, look back. Find a blessing in disguise that’s already been a part of your life. A prayer that was answered through a twisting and turning journey. Remember, the journey doesn’t have to be long – it can be arriving late for an appointment that somehow connects you with someone special or spares you from an unpleasant event. Recognizing that blessings in disguise have been part of your world before will help to calm you while you await resolution to your current prayer. “Jesus, please don’t teach me nothin’ new today.” A favorite Oprah Winfrey quote. We’ve all been there. 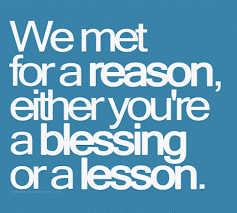 Yeah, yeah lessons. We get it. But please not today. Today, I really just want to drink my coffee and stay in my robe. I’d really love to skip School. These are the lessons that don’t usually look like lessons. The child crying in the supermarket; the nasty attendant at the bank. When we remember our prayer and we put what happens around us in that context; look through that Blessing lens, we gather truly important messages that, when we reflect on them, help us in very special and very personal ways. … birds of the air. Matthew 6:26 Trust is a fragile and amazingly complex Place. The Bible reminds us that God cares for the birds of the air and could He possibly care less for us. In our dark times, the times when we’re waiting for answers to come, it’s easy to lose faith. Easy to begin to believe that you may never get your answer and that your prayer isn’t important enough. That you aren’t important enough. When we don’t recognize blessings in disguise, we can often feel abandoned. By trusting that our prayers are always, always heard and in some way answered, we can feel less alone and we can begin to see our answer as it comes. Even if it arrives in little snippets. 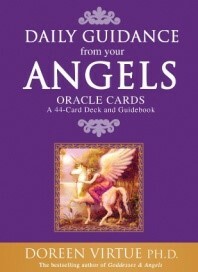 When you receive the angel card Blessing in Disguise, our Angel is giving you both a prompt and a prediction. She is advising you that your answer is already taking place. Already forming. Swirling in the clouds pictured behind her. In the “answering” you’ll often find that things are lost. Know that they are relationships or possessions that needed to leave your life and will be replaced by gifts of love and stability that are better than those you needed to release in the process. This card reminds us that answers in-and-of-themselves are a process and that parts of our prayers will be answered as we go. Some we’ll recognize as mini-answers; some we won’t. When Blessing in Disguise enters your reading, it’s because you need a little – or a lot of! – encouragement toward understanding that you aren’t alone on this often confusing path. Keep in mind that our angel not only whispers the answer she’s been entrusted to deliver, but becomes that answer, as well. Illustrated by the colors of her dress mirroring the swirling colors of the answer, our angel is invested in being with you while she parcels out the good and the not so great and the confusing pieces of the puzzle. Know that she performs her duty with absolute love and respect and delivers your answer flawlessly. The reading for this card is multi-fold: It is confirmation that your prayers have been heard and your answer prepared and, at least in part, conveyed. To truly hear every layer of your answer, come to the experience with a sense of gratitude for all that you have and all that you will be given; know that everything happens for a reason; keep a fresh perspective on where you are by looking back, periodically, to see how far you have come and what twists and turns have already been part of the journey; know that the messages are going to come in all shapes and sizes and designs and that you are infinitely cared for, treasured, loved. Most of all, know that your prayer will be answered in a way that brings your soul peace.